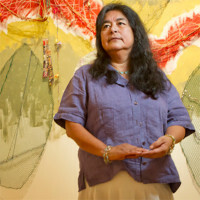 Consuelo Jiménez Underwood is most well known for her textiles and installation work. Her work represents her own history as a migrant agricultural worker, signifying her hybrid culture as well as the arbitrary lines that divide her homes. Artistic expression is deeply tied to traditional Huichol weaving, a heritage she incorporates into her large mixed media textiles. Borders and barriers are the vocabulary she uses to describe and celebrate the lives of migrant workers and indigenous people who are marginalized and downtrodden. Underwood taught at San Jose State University. She received her B.A. and M.A. from San Diego State University and M.F.A. from San Jose State University. Her work is in the Smithsonian American Art Museum and the Oakland Museum of Art.